The day's hot. So hot an so dry that all I can taste in my mouth is dust. The kinda white heat day when you can hear th'earth crack. "Saba's world is shattered when her twin brother, Lugh, is captured by four cloaked horsemen. Determined to rescue him, Saba sets off into the lawless, wasted landscape left behind by the Wreckers. It's a brutal world where Saba discovers some surprising things about herself: She's a fierce fighter, a cunning opponent, and above all, an unbeatable survivor. Teamed up with a handsome daredevil named Jack and a gang of girl warriors called the Free Hawks, Saba is off to save her brother - and maybe her whole world." 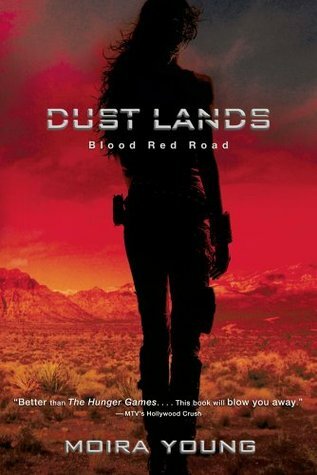 I first read the marvelous Blood Red Road a little less than two years ago, and loved it. The sequel, Rebel Heart, finally came out in paperback a few weeks ago (I wanted to have matching editions), so I figured it was time to reread the first book. I didn't remember much about it except that I'd loved it. There are so many marvelous elements to this novel: it's incredibly suspenseful and moving, the world is compelling, and there are lots of wonderful characters. Each part is excellent in its own way, and the portrayal of Hopetown is particularly a chilling, a place where everyone is driven only by a drug called chaal that causes them to be really bloodthirsty. Blood Red Road is full of suspense. Much like the first time, I raced through the book so quickly, not wanting to put it down despite knowing a lot of what would happen. The book is a little hard to get into because of the dialect, but after a few pages, I did, and then I was hooked. So don't let that turn you off; the dialect ends up being really effective in characterizing both Saba and the people around her, enhancing both the relationship between Saba, Lugh, and the other characters as well as the raw grief Saba feels during various parts of the novel. It's all set in a really fascinating world. It's not developed a whole lot, but hopefully some of the backstory will be filled in in later books. Nevertheless, the stark, scarred desert landscape is the perfect backdrop for an epic fight between good and evil. At times, the characters refer to "the Wreckers", presumably us, who had flying machines and all sorts of gadgets and ultimately ended up destroying much of the world. Education is also a thing of the past; books are regarded by some as rare objects, and not many people have the skill of reading. Like others, Saba doesn't even know what books are until she is shown one by Rooster Pinch. There's so much adventure in this novel, but it can also be really moving. Young shows the strong bond between Saba and Lugh really well in only a few pages before he is snatched away. In her view, he's the light, she's the dark, always following him, in his shadow. This makes Saba pursuing him and the riders who take him really realistic. Saba is a great character; she's tough and wants to be independent. At times, she's really nasty to Emmi, but I love how that relationship progresses. And she clearly loves her brother so much. One feels for her, but Saba's character development is great. At times she does something really kind or thoughtful, but that doesn't mean she's suddenly become a perfect person, which is quite realistic. The other characters are also amazing: Emmi, Jack, and of course the intrepid Free Hawks, a band of girls and women who roam the countryside. They're great, and so is Nero, Saba's pet crow, with near-human intelligence and a knack for showing up at just the right moments. I also in spite of myself love the romance in this book; there's no love triangle, and Jack is a great character.